(Nanowerk News) 3,500 million years ago the Martian crater Gale, through which the NASA rover Curiosity is currently traversing, was covered with glaciers, mainly over its central mound. Very cold liquid water also flowed through its rivers and lakes on the lower-lying areas, forming landscapes similar to those which can be found in Iceland or Alaska. This is reflected in an analysis of the images taken by the spacecraft orbiting the red planet. NASA's Mars Curiosity Rover has completed a Martian year -687 Earth days- this week. The vehicle travels through an arid and reddish landscape that was home to glaciers in the past. Ancient Mars held large quantities of water, yet its global hydro-geological cycles were very cold, so much so that they induced the presence of a giant ocean, partially ice-covered and rimmed by glaciers on the lower plains of the northern hemisphere. Now, an international team of researchers has confirmed this global picture locally, on the Martian site where Curiosity is roving: Gale crater. "This crater was covered by glaciers approximately 3,500 million years ago, which were particularly extensive on its central mound, Aeolis Mons" points to SINC the lead investigator of the study Alberto Fairén, from the Centro de Astrobiología (INTA-CSIC) in Spain and Cornell University in the USA. "However, at that time there were also rivers and lakes with very cold liquid water in the lower-lying areas within the crater," adds the researcher, who highlights the fact that ancient Mars was capable of "maintaining large quantities of liquid water (an essential element for life) at the same time that giant ice sheets covered extensive regions of its surface". To carry out the study ("A cold hydrological system in Gale crater, Mars"), the team has used images captured with the HiRISE and CTX cameras from NASA's Mars Reconnaissance Orbiter, together with the HRSC onboard the Mars Express probe managed by the European Space Agency (ESA). Analyses of the photographs have revealed the presence of concave basins, lobated structures, remains of moraines and fan-shaped deposits which point to the existence of ancient glaciers on Gale. In fact they seem to be very similar to some glacial systems observed on present-day Earth. 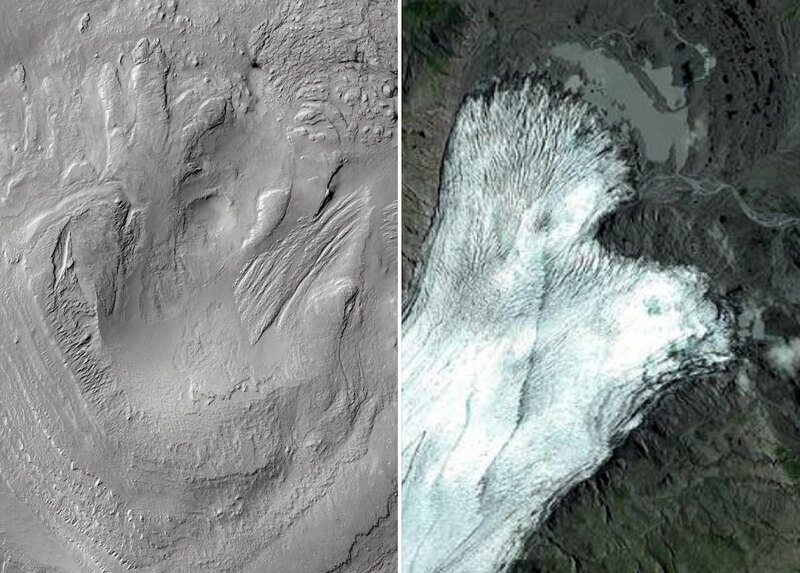 "For example, there is a glacier on Iceland -known as Breiðamerkurjökull- which shows evident resemblances to what we see on Gale crater, and we suppose that is very similar to those which covered Gale's central mound in the past," says Fairén. The article also shows images of other glacial systems on Earth which match those on Mars, such as the Malaspina glacier (named after the famous mariner in the service of the Spanish Navy) in Alaska, or others located in northern regions of Canada and the Antarctic. "As part of the Mars Science Laboratory (MSL) NASA mission, the Curiosity rover can still find evidence of past glacial activity on Gale, and on a very small-scale, for example finding accumulations of angular to sub-angular boulders, striated bedrock and striated boulder pavements and boulder chains," points out Fairén. The researcher emphasizes that the current study "provides strong local support for the global 'cold and wet' model of the ancient Martian environment, which explains both the geological traces of the presence of liquid water in the past which cover the entire planet together with the climatic models which have demonstrated that Mars was never a warm planet." In the specific case of the Gale crater, it is thought that it was excavated by the impact of a huge meteorite 3,600 million years ago and was covered by glaciers shortly afterwards. "It is even possible that the area of impact was already covered by glaciers before the collision, and in that case the glaciers would have re-covered the recently formed crater in a very short time," says Fairén, who concludes by pointing out an interesting aspect in terms of life on the planet: "The energy delivered after the impact, combined with the ice on the surface, could have generated very interesting environments from an astrobiological point of view, like hydrothermal areas for example."